Still doing quick posts . . . the thing is, these were always meant to be quick offerings of a photo, a cartoon, and a doodle. The fact that some of them evolved into long tirades into this or that thing is . . . rather, was, more me failing at my original plan than an intentional descent into philosophizing. Still, people got used to many words . . . ergo, you can read THIS if disappointed in finding too few words here or THIS if disappointed in finding too few photographs. Oldsmobile may not exist anymore but the memory lives on. Speaking of appearances . . .
By the way, those squares with the dark shapes are supposed to link you to an animated version of the comic, but I don’t think that works anymore. I don’t know if the code never caught on or the link to the source material is dead. As far as the doodle . . . I know it’s early but I saw this at a store . . . Christmas Tree – Some Assembly Required. I learned to drive during the summer in a brand new 1967 Delta 88. Then, Driver’s Ed was a required class in high school. Some dealership supplied the cars. It was nicer than my parents’ 1966 Galaxie 500. How things have changed. Yes . . . driver’s ed now includes everyone in the car, even the instructor, texting. If I’m not mistaken, didn’t Vera have a white Olds? I thought it very classy! I don’t remember what she drove . . . I do the remember the ’65 Impala. 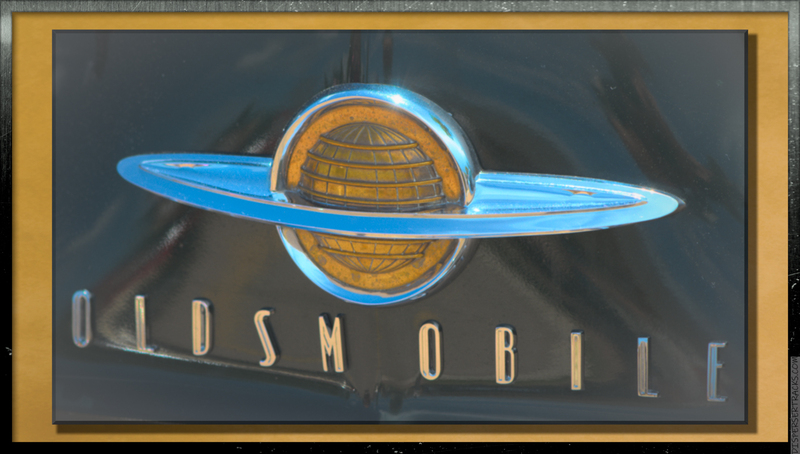 PHOTO: Cool old Olds logo! CARTOON: Wow, never heard of the cartoons having links like that! That’s fun! You got the right idea, Willy! Always try to look like you’re with it! ;-) HA! DOODLE: Beootiful doodle! Scary words: Some assembly required! HUGS and Happy Sunday to you and Melisa!!! Thanks, Carolyn, and happy Sunday to you as well. Is the end in sight yet; or have we a few more years of these projects to suffer? Surely you must be tiring of the whole thing. I’m very sorry to hear about Coco . . . but another way to look at it is that presumably, it’s for his own good. The same can be said about your own adventures under the knife and before you say that it’s worse for Coco because he might not understand . . . well, I’ll leave it at that. As for this project, if you employ math (they do have math down there, right? And, it’s the same as here, right? Not upside down or anything weird) then you could calculate 313-166 is about 147 more posts . . . unless I keel over from all the criticism I get and — me having died from the grief — this whole blog will shut down.